Ohmigosh, I wouldn't even dream of buying an article of clothing for $1200. I do like the color, but even the thought of wearing a jacket that expensive gives me anxiety for some reason haha. I'm totally down the Delia's...and I like that Forever 21 linked above a lot. I just looked at that jacket and now it says its on clearance for 29.99! I like the delia's jacket in ivory. I can't believe the jcrew jacket costs over $1000. sheesh, talk about a look for less. Very cute. I like the wider band at the bottom of the Delia's version. The J Crew jacket is more than my college tuition was back in 1989! Yikes! I do love the look of it, but seriously- if I spilled anything on it I think I'd have a heart attack. Thanks for showing a more realistic version! So cute! 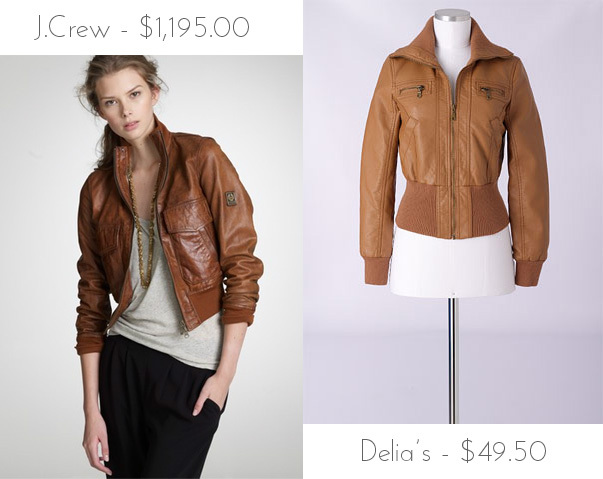 Love the moto leather jackets in camel, there is also a cute one over at Old Navy right now.